Serious question. Why would anyone use the name “mixed berry” when “jumbleberry” is available? Mixed berry is an ambiguous yogurt flavor. Possibly a suspiciously giant scone option at Starbucks. So. There’s that. But jumbleberry! Jumbleberry bumbleberry humbleberry pie. Get on this train right now. Is there anything not fun about jumbleberry? Saying it? Fun. Making it? Also fun. Eating it? SO MUCH FUN. It’s sweet and slightly tart and full of bursting little berries, rubies of every size, staining plates, forks, and lips with deep purple juice. 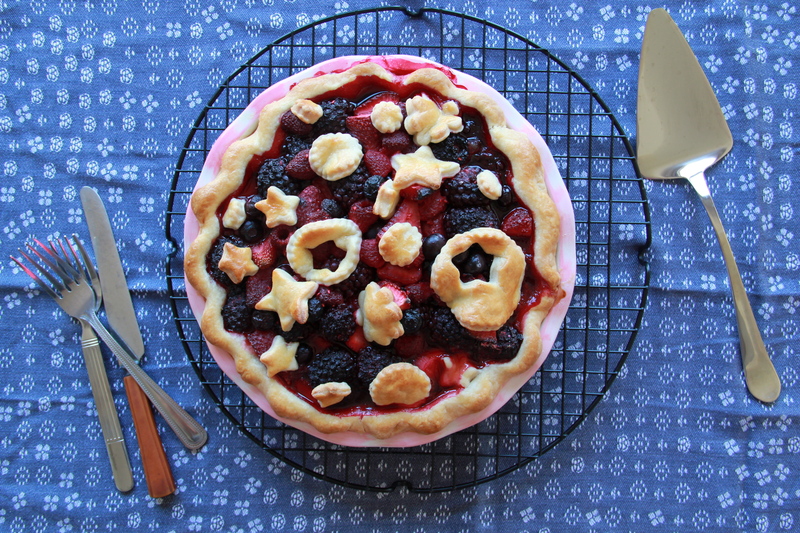 A summer-scented pie bringing berry-stained smiles. So go gather your ingredients, and jumble one together. A jumbleberry rumbleberry humbleberry pie (I could keep this up for awhile. …Crumbleberry. See? Definitely. So you’d do well to get going). Top with ice cream. Eat with friends. Yumbleberry. Yup. To make the pie crust, dump the flour, salt and sugar in the bowl of a food processor fitted with the steel blade. Pulse for about 5 seconds to combine. Add the cubed butter and pulse about 10 times, until the butter has been processed into bits the size of small peas. With the motor running, pour the ice water down the feed tube and continue to pulse until the dough starts to come together. Transfer the dough to a floured surface and gather it into a flat disc (it will be a bit wet and sticky – flouring your hands will make it easier to shape). Wrap it tightly in plastic wrap and chill for at least 1 hour in the refrigerator (or about 30 minutes in the freezer). While the dough is chilling, combine your berries in a large bowl. Squeeze lemon juice over the berries, and sprinkle them with sugar. Add the cornstarch, and gently mix everything together, being careful not to crush the berries. Set aside. Once chilled, remove the dough from the plastic wrap and set it on your floured work surface. Use a sharp knife to cut off a thick sliver of dough from your disc — just less than 1/4 of the dough. You’ll use this to decorate the top of the pie. Re-wrap that small piece in plastic and place it back in the fridge. Use ample flour and a rolling pin to roll the rest of the dough into a large circle, about 1/4-inch thick. Carefully transfer the rolled dough to a 9-inch pie dish, handling the soft dough gently and crimping the edges to your liking. Place the crust-filled pie dish in the refrigerator or freezer to allow the dough to re-firm. Once the crust is well-chilled and firm, remove the pie dish and the smaller piece of dough from the refrigerator or freezer. 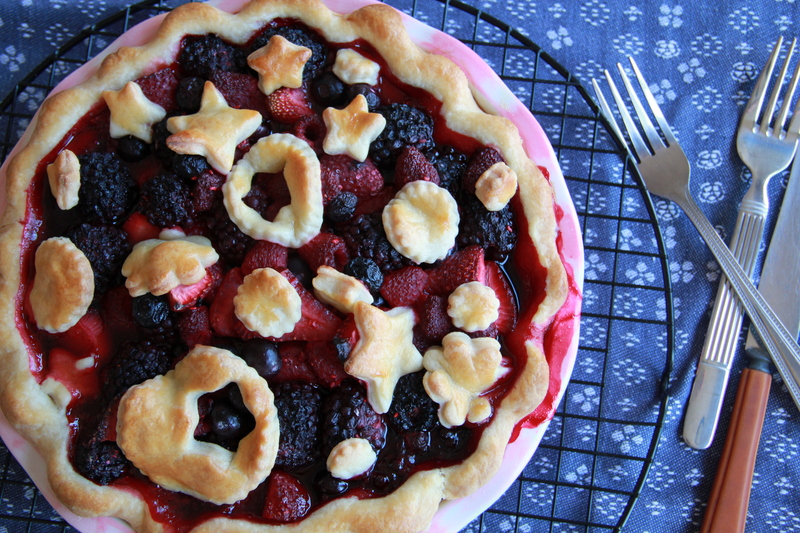 Pour the berry mixture into the pie shell, and set aside while you prepare the decorations. To decorate, roll the small piece of dough out on a well-floured surface to about 1/4 to 1/8-inch thick. 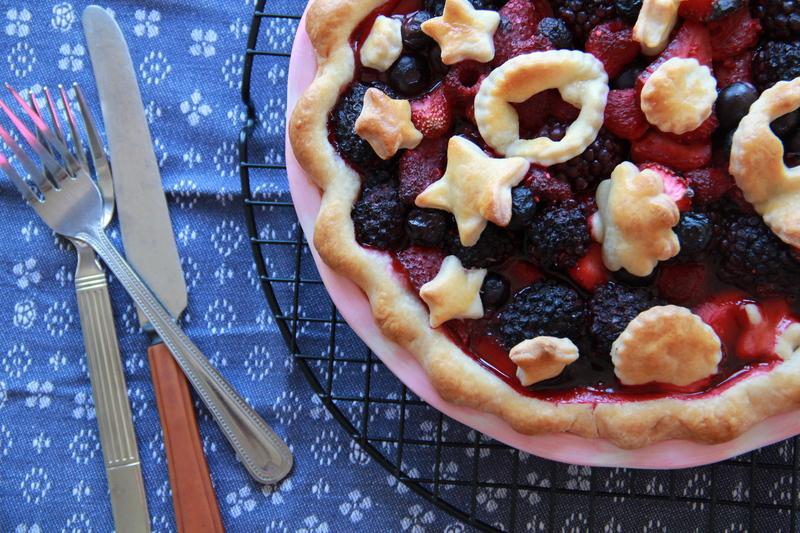 Use small cookie cutters to cut out shapes (I like circles, stars and flowers), and lay them gently on top of the berry filling. Brush the shapes and the crimped crust with egg wash, and place the pie on top of a large sheet pan (to catch juice drips). Bake the pie for about 1 hour, until the berry juices are bubbling and the crust is a deep golden brown. Allow to cool before slicing and serving with ice cream.